Multigrain – Next time look for the words whole grain or 100% whole wheat. Multigrain just means the product is made with several different grains, that DOES NOT mean they are always the healthy ones. Whole grains have more fiber and other nutrients than processed foods. Often processed foods have been stripped of the healthiest portion of the grain. No sugar added – Watching calories and carbs? Beware. No sugar added products might contain added ingredients like maltodextrin, a carbohydrate. These simple sugars are sure to raise your blood sugar. Also, no sugar added doesn’t guarantee that the product is calorie free either. Remember some food contain natural sugars such as: fruit, milk, cereal, and vegetables. Sugar free – Often times a sugar free version is no better than the regular version. Sometimes it might even have more calories. Sugar free products have less than 0.5 grams of sugar per serving, BUT they still contain a bountiful of calories and carbohydrates from other sources! Zero trans fat – If a product contains less than 0.5 grams per serving, manufactures are allowed to claim that their product contains no trans fat. So watch out you still might get a good amount of trans fat added to your diet if you don’t stick to a single serving! 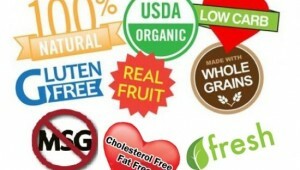 Fat free – We’ve all heard of the dangers of saturated and trans fat. Fat-free may be free of those fats, but may contain just as many calories as full-fat versions. Light – To be considered light, the fat content has to be 50% less than the amount found in comparable products. That doesn’t mean it’s nutritional. Manufacturers have been known to use the term to refer to flavor rather than the ingredients. Made with real fruit – A product may be made with real fruit, but it may not contain very much actual real fruit. Companies don’t have to disclose the amount they actually use. Organic – Organic may just be placed on foods to make you think it’s healthy. Organic foods can still be packed in fat, calories, and sugar. Organic just means 95% of the food was grown or processed with out fertilizers or pesticides. Serving size – Products may base their nutritional information on unrealistic serving sizes to make it seem healthier.